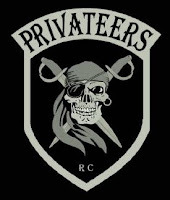 The Privateers Riding Club was founded by a group of friends with more than 85 years of riding experience combined. Born from a desire for a strong bond of friendship and the love of the motorcycle lifestyle, their "Dirty Jack" patch was designed to pay tribute to the brotherhood of privateers from long ago and their independent spirit. The club is made up of independent riders that wanted to hang out, ride and party together. They ride heavy touring and cruiser type bikes, and do a lot of long distance riding.